Fire Chief Warren Borsari is implementing new staffing procedures at the Fire Department. From the beginning his tone was strong: this is something that he has the authority to do as a “strong chief” and is doing. Even from the beginning of the forum within the Monday night’s Selectmen’s meeting, Chairman Mark Russo acknowledged that though the Board supervises the Fire Chief, the Chief has broad powers through the state’s “Strong Chief” law to run the department. Russo set up forum rules so that the Chief could speak first, followed by questions from Selectmen and then from the public, many of whom were members of the Fire Department in uniform. Chief Borsari began by stating that his current staffing “on call” model is failing. Plympton’s fire department operates on an all “call”, or essentially volunteer basis, and as fewer citizens are available to respond to calls during the day because they work or live out of the area, it is increasingly difficult to staff. Borsari said that ever since the town switched to an advanced life support ambulance several years ago, by law he always has to have a paramedic on stand-by at the station to staff that ambulance. As things currently work, the department only has one full-time paramedic/firefighter, which was recommended by the Ambulance Study Committee in 2013. The Ambulance Study Committee hired an outside consultant to look at different options for the town’s ambulance services then. At the time of the independent consultant’s study, according to the Chief, Plympton had about 250 ambulance calls, even though the consultant warned of implementing this change carefully lest call firefighters would have to be fired. The Chief hired the one firefighter/paramedic on the recommendation of the Ambulance Study Committee. As of the time of the meeting, the department had answered 259 calls, 185 of which were EMS related. “At any given time, we have a problem staffing the calls,” even despite the Chief’s assurances that ambulance wait times were well within national averages. Since the majority of the staff comes from out of town, and are not all cross-trained as firefighters and paramedics, (only 8 active members live in town, he said) in the daytime it is especially hard when so many members would have to leave other jobs out of town to respond. 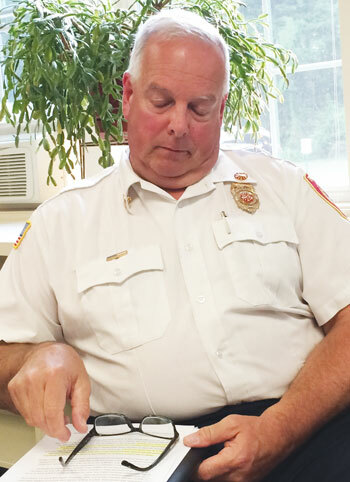 The Chief, who carefully looked over several proposals with Selectman Colleen Thompson and Town Accountant Barbara Gomez, formulated a plan within his budget that would increase full-time firefighter/paramedics. Russo asked the first question from the Selectmen: “What’s your budget going to look like in the future?” bringing up that with increased call volume and fewer volunteers to respond, that costs will go up. The Chief responded, “The call volume has increased exponentially year after year for various reasons,” which he did not specifiy. “Even if we do this this year within our budget, are we not setting ourselves for an increase in future budgets?” asked Russo. The Chief listed off many things that cause budgets to go up, such as equipment, payroll and increased training. Joy also inquired about the details of the plan again, which the Chief re-stated, and he and his lieutenant explained the specifics of some of the costs to Joy. “We’re decreasing our overhead while increasing the money available to operate the ambulance,” according to the lieutenant. The chief also mentioned that fighting fires is a very small percentage of what a firefighter does these days. Selectman Colleen Thompson asked about any “close calls,” to which the Chief gave an affirmative response. “Sometimes only one person shows up in a fire engine,” he said. Susan Ossoff, Chairman of the Finance Committee, was concerned and asked if any type of five-year cost projection had been done. The Chief responded that he couldn’t do one. “Do you see your entire force in five years as full time,” she asked. “No, said the Chief, even though he had stated only minutes before that the call system is dying off in the northeastern United States. Art Morin, Board of Health Chairman, expressed concern several times that this was all happening directly after Town Meeting and that the public didn’t have a chance to discuss it. While the Chief was overall on the defense during the night, and the public had many questions, the meeting was civil. The forum lasted for the first hour of the Selectmen’s meeting. Russo reiterated that due to state laws, especially the ‘strong chief’ law signed onto by the town, the Chief largely has control to implement any plan within the budget voted at Town Meeting. Selectmen Joy and Thompson agreed. The Chief at several times stated that he is implementing this plan for the safety of the people of Plympton and the safety of his personnel, and the law is behind him. It is likely that this “strong Chief’s” plan will be implemented. Section 42. Towns accepting the provisions of this section and sections forty-three and forty-four, or which have accepted corresponding provisions of earlier laws may establish a fire department to be under the control of an officer to be known as the chief of the fire department. The chief shall be appointed by the selectmen, and shall receive such salary as the selectmen may from time to time determine, not exceeding in the aggregate the amount annually appropriated therefor. He may be removed for cause by the selectmen at any time after a hearing. He shall have charge of extinguishing fires in the town and the protection of life and property in case of fire. He shall purchase subject to the approval of the selectmen and keep in repair all property and apparatus used for and by the fire department. He shall have and exercise all the powers and discharge all the duties conferred or imposed by statute upon engineers in towns except as herein provided, and shall appoint a deputy chief and such officers and firemen as he may think necessary, and may remove the same at any time for cause and after a hearing. He shall have full and absolute authority in the administration of the department, shall make all rules and regulations for its operation, shall report to the selectmen from time to time as they may require, and shall annually report to the town the condition of the department with his recommendations thereon; he shall fix the compensation of the permanent and call members of the fire department subject to the approval of the selectmen. In the expenditure of money the chief shall be subject to such further limitations as the town may from time to time prescribe. The appointment of the chief of the fire department in any town or district having a population of five thousand or less may be for a period of three years. ~ From the 189th General Court of The Commonwealth of Massachusetts Web site.